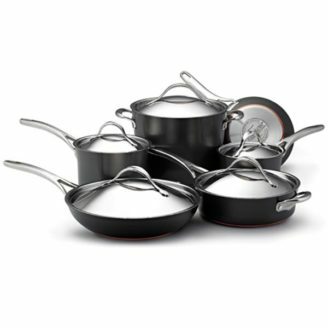 A cookware set is a great way to get a collection of pots and pans without having to handpick pieces. But cluttering your kitchen with cookware you’ll rarely use is a waste of both money and storage space, so it’s vital to get the right pieces. We spoke to food bloggers, professional chefs, and cookware fanatics before bringing in 14 sets for hands-on comfort and heat distribution testing. We found that materials, heat conduction, and practical features were the most important considerations in find the best pots and pans. 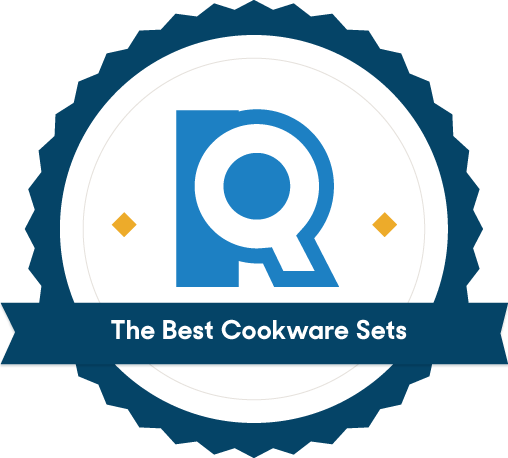 We started with bestselling cookware sets from major retailers like Amazon, Bed, Bath & Beyond, Macy’s, Walmart, Crate & Barrel, and Williams Sonoma. We wound up with 66 contenders ranging from 5-18 pieces, with a variety of construction materials and an even greater variety of price tags. Our cheapest sets started at $40 while our most expensive reached a whopping $2,000. While it’s tempting to go straight for the 17-piece cookware set, bigger sets don’t necessarily give you more bang for your buck. In fact, you’re likely to end up with overly-specific pieces, like oval fish pans and small sauciers, or simple filler items, like cookbooks and spatulas (yes, pretty much anything in the box counts as a piece). So while not everyone needs the same pans — those cooking for one or two people will generally require fewer and smaller pieces than someone cooking for the whole family — the best cookware sets will contain useful, versatile pieces, without doubling up on impractical sizes. We talked to experts and scoured cooking blogs to identify the most useful, versatile pieces for both novice and confident home cooks. Then we made an ideal set list and checked how well our contenders measured up. We gave preference to those that included pieces from each of our five categories, while not unnecessarily doubling up. A smaller pot great for boiling eggs, small batches of grains or legumes, and reheating soups and sauces. A medium pot ideal for boiling/steaming veggies and making small batches of pasta. A large pot for making stock, stews, pasta, and soups. A dutch oven is typically shorter, wider, and a bit more oval than a stock pot, and usually comes in smaller sizes. A deeper pan with straight sides perfect for searing meat, making risotto, and whipping up sauces. Different types of cookware construction will result in different cooking experiences. It really comes down to preference and how long you’re willing to scrub at the kitchen sink. We discovered that the main things to keep in mind with cookware materials are: cooking surface, heat conducting core, and exterior body. There are several different options for cooking surfaces, including (left to right) stainless steel, ceramic, and nonstick. 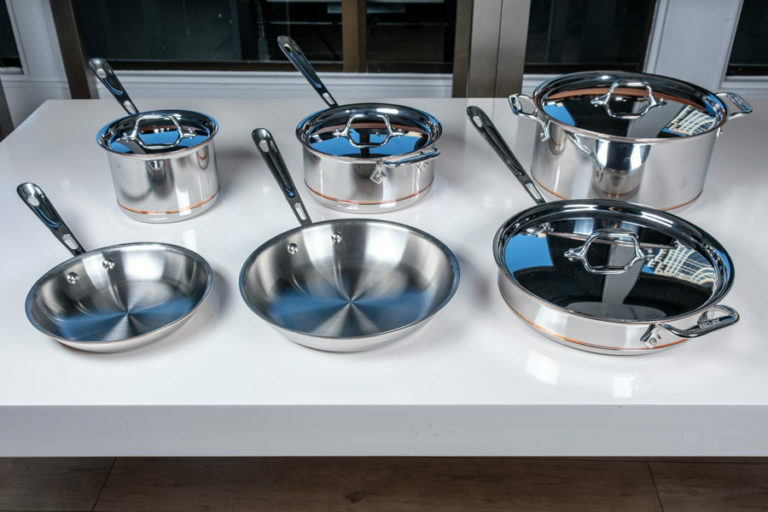 Most cookware has alternating layers of metals with a conductive core of aluminum or copper. More layers deliver better heat distribution, greater durability, and a heavier pan. The outer layer, or exterior body, is often stainless steel, aluminum, or anodized aluminum (aluminum made more durable and non-corrosive through an electrochemical process), because these materials are generally lightweight and conductive. Both the All-Clad Copper Core (left) and Anolon Hard Anodized Copper (right) have visible copper cores. We didn’t consider cast iron, enameled cast iron, or copper cookware sets because their specialized care instructions and ingredient limitations mean we probably don’t need a whole set of them. Our experts recommended you really only need one or two pieces of these specialized materials, and a whole set would be more expensive and not practical for everyday use. 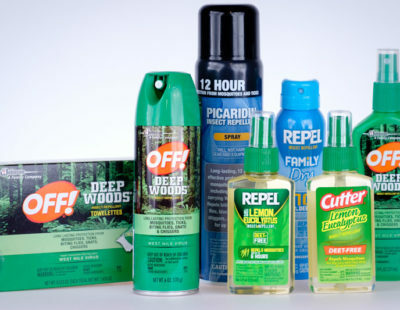 At this point, we dug into each product and chose sets with impressive construction (like multiple layers and heat conducting cores) and those manufactured by reputable brands recommended by Consumer Reports. We then brought in 14 contenders for hands-on testing. 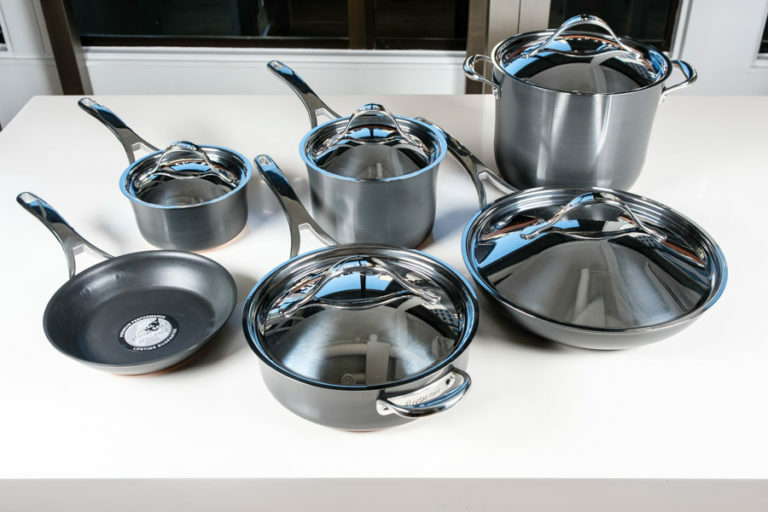 As we unboxed our 14 shiny cookware sets, we quickly noticed some key features that would add up to a world of difference in everyday cooking. The All-Clad's handles (left) had relatively sharp edges that made them less comfortable than more rounded options like the Tramontina (right). A comfortable and well-balanced handle is vital. All our sets came with metal or silicone handles — our experts advised plastic handles tend to crack, fade, and can’t handle high heat — but we discovered not all handles are created equal. We gave bonus points to handles with full contours that fit snugly in our grip, and lid handles that were smooth and accommodated larger hands. We also considered the heft of each piece and whether the design felt balanced enough to handle the construction’s weight. If a pot or pan feels too heavy when empty, it’s going to be a real pain when full. We also found some nice-to-have features that mostly come down to preference and probably won’t make or break your love for a set. Glass lids allow you to keep an eye on what you’re cooking without lifting the lid and releasing heat. Measurement markings inside pots mean you can easily keep track while topping up liquids, although some, like the Calphalon, had such dark markings that they were indistinguishable from the pot’s surface. Every set we tested had holes at the end of each handle for easy hanging and display, but we also looked at how easy it would be to stack your set for cupboard storage. Most sets packed away into two or three stacks, but lids turned out to be the biggest culprit — they are unapologetically unstackable. If you want a neat solution for storing lids, consider a lid rack holder. Heat distribution refers to how well heat is maintained throughout the cooking surface of a pan. Poor distribution of heat in a pan creates “hot spots” that can scorch your food and cook things unevenly. So we tested the three most common pieces of cookware in each set (saucepan, skillet, and sauté pan) for heat distribution using a thermal imaging camera. Fast heating is an important factor for professional chefs, like Nick Musser, Corporate Chef at Bargreen-Ellingson Restaurant Supply Store, who told us he expected his pans to quickly react to heat: “I hate a pan that takes forever to heat up. 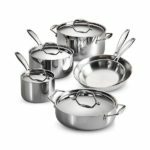 I want to hear that garlic or butter sizzling within a few seconds.” However, we noticed that thinner, lighter pans, like the Rachael Ray, Martha Stewart, and Cuisinart Multiclad quickly skyrocketed to above 400℉, which is much too hot for nonstick coating. The only pans that spectacularly flunked our heat test were the Calphalon, which warped after just a minute. A warped pan means an uneven cooking surface that can result in poor heat distribution. In the end, we found that individual cookware sets tended to be perform consistently. Those sets that struggled had the same issues across the board and the sets we loved had the same strengths in all their pieces. The Anolon Nouvelle Hard Anodized Copper 11-Piece Cookware Set offers an impressive assortment of 11 thoughtfully-sized pots and pans for every occasion. It embodies versatility, with small and large pieces to serve up whatever your recipe calls for: 8.5” and 12” skillets and a 3-qt (10”) sauté pan that lands nicely between those two sizes, 1.5-qt and 3-qt saucepans, and a big 8-qt stock pot. Not all our contenders offered such thoughtful distribution among sizes, which is exactly what you want in a set. The Anolon Hard Anodized Copper has a density and heft that indicates good design and quality construction, while not being too heavy to handle. It's made primarily of aluminum but with a copper core to reinforce longevity and enhance heat transfer. While the set advertises itself as “metal utensil safe,” it’s probably better to stick to silicone or wood utensils, as Amazon reviews cautioned this wasn’t a foolproof feature. The Anolon Hard Anodized Copper's visible core, flush nonstick rivets, and generously thick pan handles. Did we mention the Anolon is also dark and handsome? With flush, nonstick rivets for easy cleaning, full contoured handles that provide a comfortable hold, and a visible copper core that contrasts nicely with the dark grey surface, the Anolon was one of the most attractive cookware sets we saw. In our testing, the Anolon Hard Anodized Copper had safe and effective heat levels with an even distribution. It reached about 300℉ between both pans after a minute on the warm burner — the perfect temp to start your sizzling. The Anolon is oven safe up to 500℉ and is compatible with all cooktops, including induction. It’s also slightly high maintenance and is listed as hand wash only. This isn’t a huge problem for most, as its nonstick coating makes it pretty easy to clean, but just be aware that if you do forget and load it up with all your other dishes, the copper core and nonstick coating could be compromised in a dishwasher. This is generally the case with all nonstick cookware, including our budget pick the Rachael Ray Nonstick, as it requires hand-washing in order to preserve an already limited lifespan. Each piece features an aluminum core wrapped in three layers of stainless steel and is fully clad, meaning all those extra layers coat up the sides of the pan too. When aluminum wraps up the sides of a pan, it brings its excellent heat conduction up there, too. In our testing, the Tramontina Tri-Ply Clad was a frontrunner. Its skillet was the hottest of the stainless steel in our one minute test, reaching a (relatively) impressive 138℉. It also brought a quart of water to boil in just 7 minutes, several minutes ahead of almost all the other stainless (the Lagostina was speedy too, but it came at a heavy cost - the beautiful copper outer finish permanently changed to an ombre pink after heating each pan just once). The Tramontina Tri-Ply Clad is sleek in design, with no visible layers or breaks in the construction. There’s also no lip on the edge of the pots. Usually this means a less-controlled pour, but because the pieces are so light, it won’t take much momentum to get a drip-free drain. That lightness is paired with a very comfortable handle that thickens as it extends, filling your grip in the palm but thin enough at the fingers to wrap them around it. The Tramontina Tri-Ply Clad's contoured stock pot handles, small but well-made rivets, and slender balanced pan handles. Its stainless steel construction means the Tramontina Tri-Ply Clad is also dishwasher-safe — a real draw card when facing a mountain of after-dinner dishes. Amazon reviewers do caution that the stainless steel lids can get a bit hot after prolonged use over heat. So fast-moving cooks, be sure to leave a hotpad nearby. Overall, we felt comfortable and in control when handling this set, and the Tramontina Tri-Ply Clad’s full lifetime warranty put our mind at ease should any issues arise. 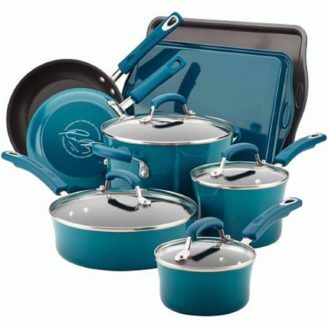 We were initially skeptical about celebrity chef cookware as we had concerns they’d be more style than substance, but this aluminum nonstick Rachael Ray set surprised us. For just $110, you get 10 decent sized pieces (although a bit on the small side), and two extra kitchen accessories that vary depending on where you buy your set (our Walmart one included two baking sheets). Not only does it include those kitchen extras — a nice bonus for those on a budget looking to fill their dorm kitchenette or outfit a vacation condo — but the Rachael Ray Nonstick was a solid performer in our tests. Due to their thin but durable aluminum construction, the Rachael Ray Nonstick skillet and sauté pan were the fastest of all our contenders to heat. 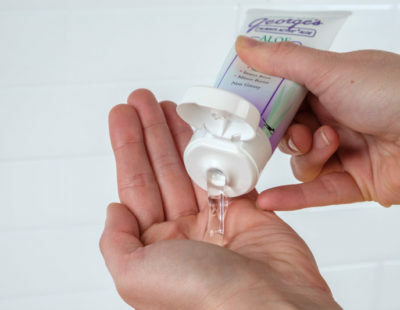 We found the silicone-coated stainless steel handles provided a comfortable fit and the small thumb-shaped dips were ideal for leveraging your thumb on top of the handle. The silicone handles on the glass lids were comfortable, too. Although these silicone features do bring the oven safety temp down to 350℉. The Rachael Ray Nonstick also comes in various ombre colors, depending on where you buy it. 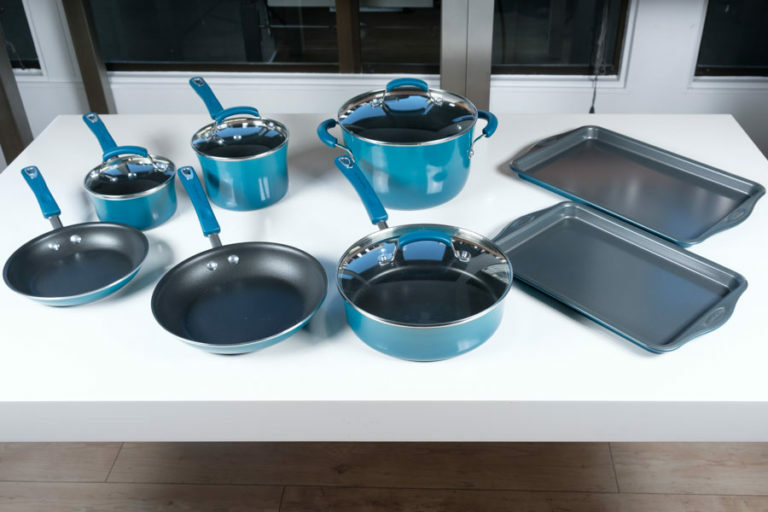 The Rachael Ray Nonstick's ombre teal finish and silicone pot handles, rivets, and contoured silicone pan handle. While we loved how quick the pots and pans were to heat up, there’s some danger that they could actually get too hot. Ours got up to 500℉ in less than a minute on high heat — approaching hazardous range due to the nonstick coating. It’s best to heat nonstick cookware over medium to low heat to avoid these soaring temperatures. Overall, the Rachael Ray Nonstick set is smaller than our other top picks. With a 6-qt. stock pot instead of an 8-qt. and a small 1-qt. saucepan (think ramen noodles or solo boiled egg), this set is best suited for cooking for one to two people, or the occasional vacation home cook up. Its compact size does make it a great storage option for smaller kitchens, though. When it comes to trophy-kitchen looks, the All-Clad Copper Core features a trendy visible copper layer near the bottom of each piece. The inside surface is as smooth as the Tramontina, and the All-Clad Copper Core even advertises a polished finish that adds some stick resistance — a miraculous feat for stainless steel and a feature that’ll tempt anyone familiar with the cleaning woes of this cookware. And just like the Tramontina and the Anolon, it has a great range of practical pieces: 8” and 10” skillet, 2-qt and 3-qt saucepans, 3-qt sauté pan and 8-qt stock pot. 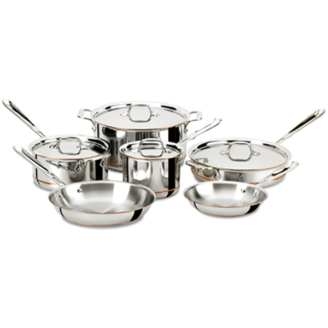 All-Clad clearly doubled down on heat conduction in this set, with 5-ply construction of stainless steel, aluminum, and copper layers, so you should have no issues searing, browning, and sautéing to your heart’s content. It was the second hottest stainless pan we tested, reaching 135℉ after just a minute on the burner (the Tramontina got to 138℉). These results may seem lukewarm, especially compared to speedy nonstick heaters, and they are, but longer preheating is pretty much par for the course with stainless steel. Straight up, we are not fans of All-Clad’s trademark handles. Due to the brand’s popularity, we tested three different All-Clad sets and this is the only one that passed muster. Why? A tiny addition to the underside of the unique All-Clad handle that gives enough leverage for the heavy base and actually makes them comfortable. 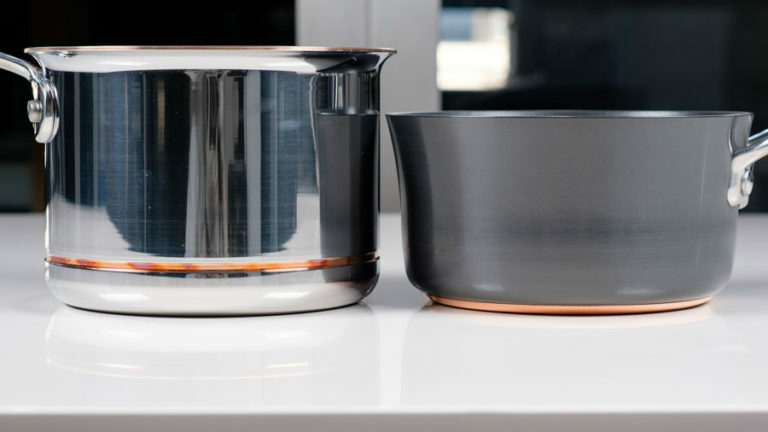 While we weren't fans of All-Clad's standard handles, we did appreciate the small underside bump (right) on its Copper Core series that improved handling and balance significantly. 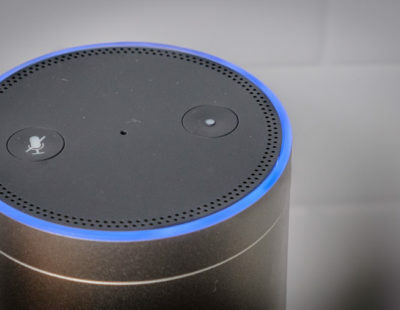 The biggest downside to the All-Clad Copper Core is its enormous $1,300 price tag. To be frank, you’re partly paying for the brand name, but a perk of that brand name is a ‘Made in the USA’ guarantee which means quality materials and high quality control standards. For a cookware set that calls for its very own stop on your home tour, the All-Clad Copper Core offers both quality and beauty alongside culinary prestige. All those extra layers that create such excellent heat conduction also add up to extra weight, and on average the All-Clad Copper Core pans were almost twice as heavy as their Tramontina counterparts. In general, it's best to hand wash all of your cookware, but with nonstick it’s vital. Dishwashers will clean the pan at high temperatures that will wear off the nonstick coating. When hand washing nonstick, it's best to use softer scrubbing tools as anything too abrasive can damage the nonstick layer. If the coating is too compromised, it’ll start peeling and could break down the nonstick to release toxic compounds that otherwise wouldn’t be an issue. When it comes to maintaining the sheen of stainless steel (copper too), Martha Stewart recommends a scouring powder called Bar Keepers Friend that will shine the steel and eliminate water spots or discoloration. Cleaning the dirty pans can get a bit trickier — stainless steel lacks nonstick capabilities and even regular use can leave food caked on. A simple solution: Boil soapy water (filled just enough to submerge the stuck food), gently scrape it off with a flexible spatula, and rinse when it's cooled. The metal on the bottom of nonstick pans will scratch the nonstick coating if they’re stacked directly on top of each other. This doesn’t mean you have to hang your non decorative teflon pans, just make sure to layer a soft cloth between each pot and pan to protect the nonstick surface from coming into contact with bare metal. Do you need a whole set? 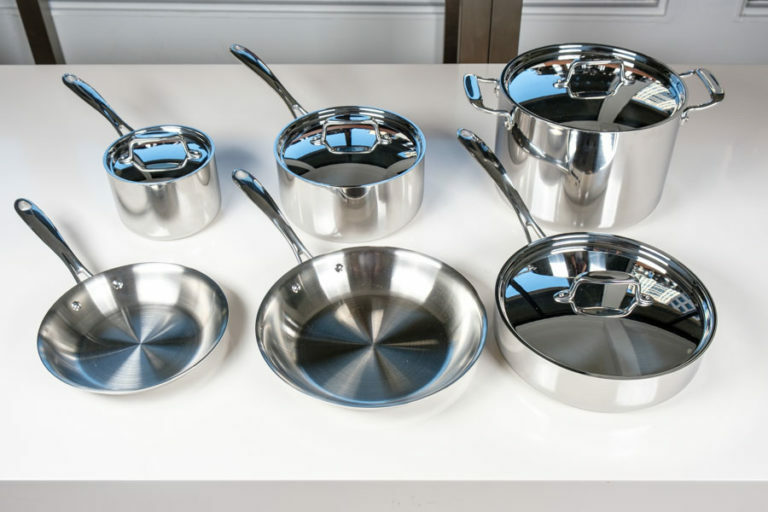 A few reasons you might want to purchase your cookware individually: If you already have several pieces that come in a standard cookware set, if just a few of your pieces are peeling or discoloring, or if you’re an experienced cook and know exactly which pieces you want. Filling your kitchen this way also allows you to mix and match materials and sizes— like if you only really need a nonstick piece for a frying pan, but would rather pick up a stainless steel stock pot. What other cookware pieces do I need? Almost all our experts said that a cast iron skillet was worth investing in. They’re versatile, precise, and just about nonstick when well-seasoned. They can also last a lifetime, a potential heirloom that will only make tastier food with each decade. They do require unique maintenance, so be sure to do your homework to properly season and care for cast iron. The classic Le Creuset came up pretty often, too—both as a braiser and dutch oven. This piece is just as versatile as the cast iron skillet, and you can take it from stove to oven to tabletop. 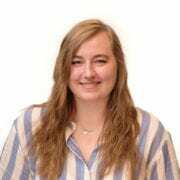 Loryn Purvis said she uses hers to “slow cook short ribs, pan fry chicken, sauté and even bake.” These are both also great options for a wedding gift that’s less extravagant than a whole cookware set, but just as valuable. Don’t worry, they’re not toxic. Nonstick is the standard term for any surface coated with polytetrafluoroethylene (PTFE). Teflon is a well-known brand of PTFE. The American Cancer Society says, “Other than the possible risk of flu-like symptoms from breathing in fumes from an overheated Teflon-coated pan, there are no known risks to humans from using Teflon-coated cookware. 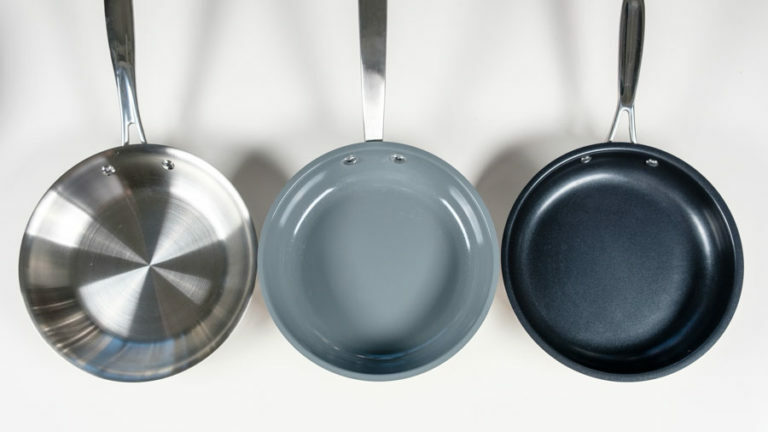 While PFOA is used in making Teflon, it is not present (or is present in extremely small amounts) in Teflon-coated products.” You’ll only need to worry about it if you’re heating empty pans over 500℉. Is stainless steel or nonstick cookware better? It depends on what’s important to you — ease of cleaning or durability and searing. Nonstick is, as the name suggests, stick resistant. This means you don’t need to use a lot of oil during cooking, making it a good option for the health-conscious. It’s typically made from polytetrafluoroethylene (PTFE), although the Martha Stewart set we tested featured a titanium reinforced ceramic coating. Nonstick is really easy to clean, but expect the coating to only last a few years before the whole thing needs replacing. Stainless steel pans are often coated but will last longer if uncoated as the steel is more durable than the coating. Stainless steel also sears and browns foods really well (something you’ll miss out on with nonstick). It is also notorious for food sticking. “I have personally cleaned stainless steel skillets from almost every manufacturer... and cleaning is a nightmare,” says Franke.